Georgia junior inside linebacker Roquan Smith (3) came on strong last season, finishing with 40 tackles in his last four games. The Georgia Bulldogs built some momentum late last football season, winning four of their final five games after a tumultuous start to finish 8-5. 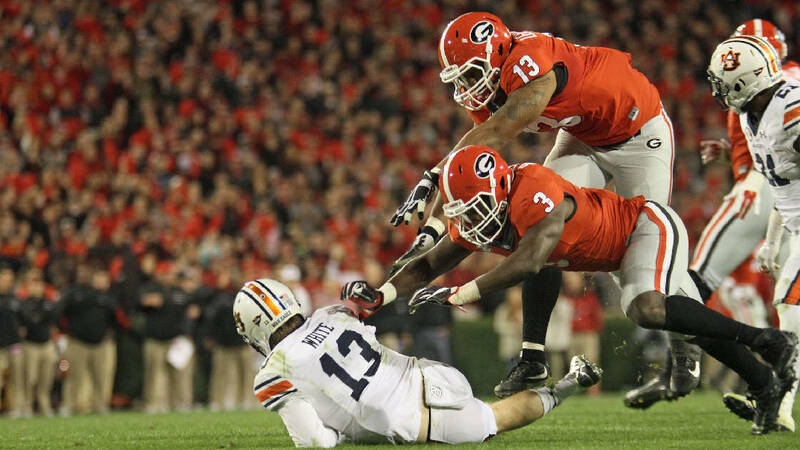 Roquan Smith finished on a roll as well, amassing 73 tackles in his last eight games and 26 tackles in his last two. The 6-foot-1, 225-pound junior inside linebacker from Montezuma, Ga., obviously wants to pick up where he left off on a defense that returns 14 of its top 15 tacklers. "There is a lot of excitement about what we have in store," Smith said last week at the Southeastern Conference's media days event. "You have to build each and every game, because if you're not getting better, you're getting worse. I'm working my tail off each and every day, because I'm looking for bigger and better things. "In those last four or five games, everything was moving so much slower to me." Smith is all the more eager for Georgia's opener against Appalachian State on Sept. 2 after missing spring practice due to surgery on a torn pectoral muscle. It was his second straight spring that was essentially scratched, with surgery to repair wrist ligaments limiting him last year. › Fun fact: Each of Georgia’s past two head coaches posted his best record during his second season, with Jim Donnan going 10-2 in 1997 and Mark Richt going 13-1 in 2002. Georgia second-year coach Kirby Smart knows what he has in Smith, comparing him last week to former Alabama and current Baltimore Ravens linebacker C.J. Mosley in terms of his athleticism and ability to cover and move in space. "Roquan is a great leader, and he has done wonders for our defense because he's a student of the game," Smart said. "It was really hard on Roquan not being able to go through spring practice, but he was in every meeting and he was at every practice. He got behind the offense and took his footwork steps. "He's a unique kid who I think is really special." Another unique aspect to Smith was his recruitment. Smith committed to UCLA in front of ESPNU cameras on national signing day in 2015, but he never signed his letter of intent. He quickly backed off his nonbinding pledge after learning that then-Bruins defensive coordinator Jeff Ulbrich was leaving for the Atlanta Falcons, and Smith decided to sign a financial aid agreement with Georgia. By signing that agreement instead of a letter of intent, Smith gave himself a departure path in case a Georgia coach left, but he wound up signing the letter that summer. "I'm blessed to have made the choice to come here," Smith said. "I can't really imagine anything different." Smith, who has no medical limitations entering August camp, will be joined inside by fellow junior Natrez Patrick, with Davin Bellamy and Lorenzo Carter manning the outside. Both Bellamy and Carter announced last December along with running backs Nick Chubb and Sony Michel that they would be returning for their senior seasons. Smart said last week that sophomore Jacob Eason is the starting quarterback and that early enrollee Jake Fromm would have to do something special to beat him out, which leaves the biggest question in camp centering around an offensive line that returns Lamont Gaillard and Isaiah Wynn and includes several heralded freshmen. On defense, the familiar faces are back for a unit Smith hopes can be reminiscent of those more than a decade ago with the likes of Greg Blue and Thomas Davis. "We know we have the capability of being a great defense," he said. "We know we can't be complacent. Most guys know what it's got to take." Smart certainly knows what he has in Smith, a former top-100 national prospect who has excelled on the field and off. "I had an academic counselor tell me before I got here that Roquan decided to do one major and came back after a couple weeks and said, 'You know what? I need to challenge myself more than that,'" Smart said. "He got in the Terry College of Business and decided to major in economics. He's got a 3.0 in that. "I think it speaks volumes to his character, and we're really fired up to have him."